RICHARD NOWAK FINE ART: Last Tuesday at the Westfield Creative Art my students continued to work on their version of my seascape oil painting below. Four were from the Carson Center with two having special needs. ALso, I had my two regular students Scott and Gloria who made progress on their paintings! 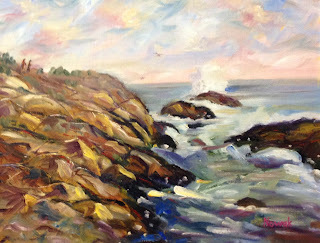 Last Tuesday at the Westfield Creative Art my students continued to work on their version of my seascape oil painting below. Four were from the Carson Center with two having special needs. ALso, I had my two regular students Scott and Gloria who made progress on their paintings!